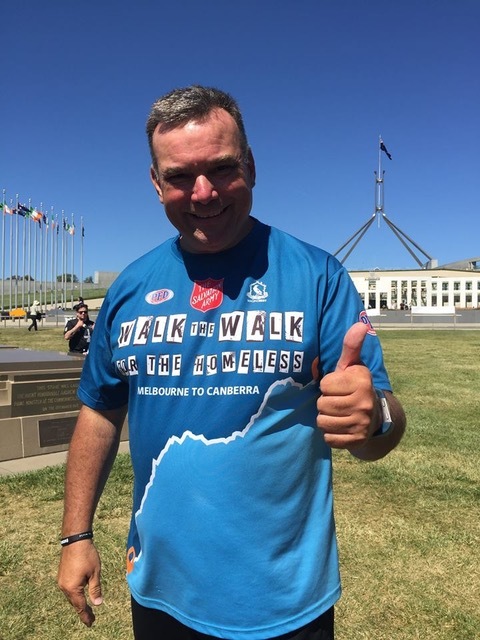 Rotary clubs from Melbourne to Canberra backed the 703km walk by the Salvation Army’s Major Brendan Nottle last month. His epic 40-day walk to Canberra via the Snowys, which began on September 8, raised national political and community awareness about the homeless. It culminated in a meeting with Prime Minister Turnbull and Melbourne’s Lord Mayor Robert Doyle AC, who describes Brendan as ‘an urban saint’. On his last lap from the old to new Parliament House, he was accompanied by Opposition Leader Bill Shorten, Minister for Human Services Alan Tudge and Adam Bandt (Greens MHR). His arrival got heavy media coverage including evening news on three TV channels. The walk also raised $130,000, easily beating the $100,000 target. Brendan leads the Salvo’s Project 614 in Melbourne, a team that works with the homeless, those with mental and addiction issues, and others suffering from social poverty. They interact daily with people from 9 to 93.